Responsible for planning, coordinating, and implementing an integrated program of fundraising and program activity in furthering the mission of both the College and the FLCC Foundation. Bachelor’s Degree required; Master’s Degree preferred. A minimum of 5 years of fundraising and supervisory experience in a leadership role, preferably in a higher education setting. Tangible evidence of metric driven donor- centric practice and a clear understanding of fundraising operations and process; strong ability to interact and develop relationships with a variety of internal and external contacts; proven experience and success in gift solicitation; ability to manage a department, including supervising employees and managing performance required. Experience with Blackbaud’s Raisers Edge preferred. Responsible for use, repair and maintenance of classroom, laboratory and field equipment; participation in projects at various off-site locations; assistance in class and field instruction of students in the Fish and Wildlife technology degree program; participation in department’s recruitment, registration and orientation functions; assisting department members with assigned tasks. 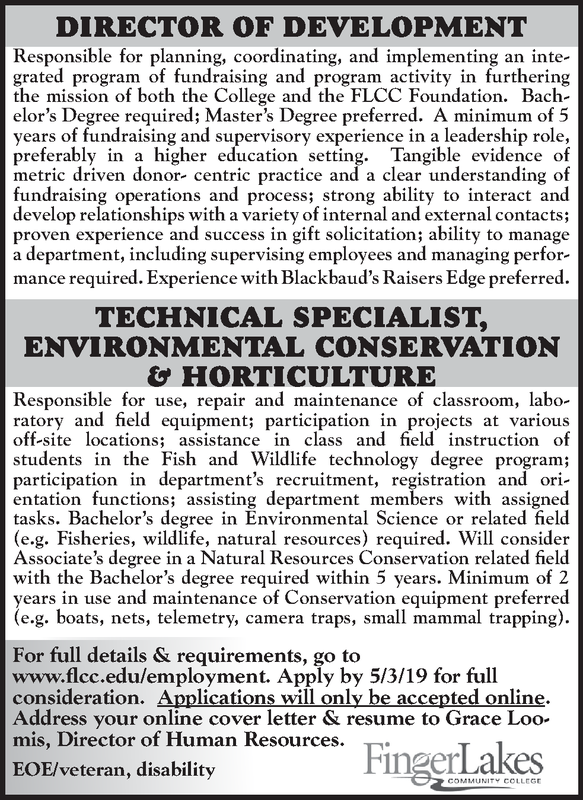 Bachelor’s degree in Environmental Science or related field (e.g. Fisheries, wildlife, natural resources) required. Will consider Associate’s degree in a Natural Resources Conservation related field with the Bachelor’s degree required within 5 years. Minimum of 2 years in use and maintenance of Conservation equipment preferred (e.g. boats, nets, telemetry, camera traps, small mammal trapping). www.flcc.edu/employment. Apply by 5/3/19 for full consideration. Applications will only be accepted online. Address your online cover letter & resume to Grace Loomis, Director of Human Resources.